US demand for consumer water treatment systems is forecast to increase 4.4% per year to $1.6 billion in 2021. Market growth will be driven by a healthy housing market, including increased conventional housing completions and existing home sales; increased consumer education about water quality and the health issues associated with certain contaminants; and technological advancements, which support value gains. There continues to be nationwide concern over the possibility of chemicals from industrial wastes and activities, like hydraulic fracturing and mining, entering the water supply. 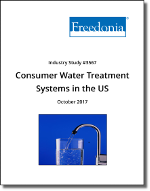 This study covers the United States consumer market for water treatment systems primarily designed to decrease the amount of contaminants and minerals in households’ water. Systems purchased by consumers for personal use outside of the home (e.g., during leisure activities, pleasure, work, or school) are also considered, as are consumables, such as replacement filters, membranes, and salt. Refrigerator water filters and pitchers are excluded because these systems are originally sold to equipment manufacturers and only the replacement units are sold to consumers. Historical data for 2006, 2011, and 2016 and forecasts to 2021 are provided for consumer water treatment systems demand both in units and in current dollars (which are not adjusted to account for inflation). Key breakouts for consumer water treatment systems include technology, system, and region. The main designation for systems is the point at which treatment occurs, entry or use. Point-of-entry treatment is defined as treatment at the location where water enters the household for the first time, prior to being dispersed to the home’s faucets. Point-of-use treatment is defined as treatment at the point where water will be consumed or used for other purposes. Consumables (replacement water filters, salt, and replacement membranes) are also included in this study. Table 2-3 | Consumer Survey Responses: "Other than general water purification, do you have any specific reasons for using these water purification items?" Table 2-4 | Share of Consumers Who Own Water Treatment Equipment Who Agree or Disagree: "I always try to eat healthy foods and maintain a balanced diet"